Beginning with the old buildings, the occasional cobbled street and the many great places to eat and drink, Clerkenwell has the sort of character you can’t build. The Clerkenwell rentals market is known for loft-living young professionals, nightclubs, restaurants and art galleries. It also houses many professional and business office areas of the nearby City of London and West End, alongside council housing. Catering to this demographic, Clerkenwell’s rentals market is mostly made up of modern, high-end flats and apartment. Clerkenwell rentals have many apartments which boast stunning views of London’s skyline. Clerkenwell has always been a hive of creativity. With a thriving design sector, the Clerkenwell rentals market lures in a trendy young crowd of professionals who thrive in this energetic environment. 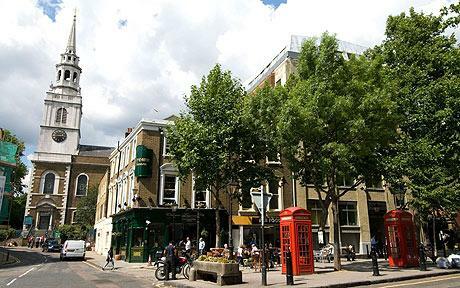 A rhombus-shaped section of town between Bloomsbury and the City, Clerkenwell is a small, self-contained and beloved suburb of London. Also, this central London neighborhood’s inner beauty matches its fashionable exterior, reputed as one of the city’s must-go gastronomic destinations. Furthermore, this eccentric quarter is one of London’s top places to live, with its unbeatable location and high-end amenities. Clerkenwell rentals are near Michelin-starred restaurants, London’s first ever gastropub, and historic bars. In addition, there are all-night bars which attract the likes of healthy crowds who enter hungrily and leave happy. This neighborhood is more than foodie-friendly, boasting the many theaters, nightlife, and a plethora of coffee shops. Known for its great entertainment options and style, Clerkenwell sits between being lavishly hip and decidedly professional. Want to know more about Clerkenwell Rentals? Nestled between the City and the West End, Clerkenwell is a hive of activity, boasting numerous pubs, clubs, restaurants, and shops. St John by Fergus Henderson is a favorite local eatery of Clerkenwell. The Michelin-starred restaurant is on the “Best 50 restaurants in the World” list – and it’s not hard to see why. Although picky eaters and the squeamish should likely avoid St John; the ever-changing seasonal menu boasts off the wall delights such as rolled pig spleen, stewed pig intestines, brains, offal, tongue, bone marrow, and more. This eclectic eatery is renowned for the creation of a whole Modern British food movement. The Modern Pantry, with a ground floor cafe, first-floor restaurant, and deli under one roof, you can sample the internationally influenced three-course menu, order birthday cake or take a sandwich away for lunch. Overlooking St John’s Square, this is a second restaurant for the New Zealander who used to co-own the popular Marylebone tapas fusion restaurant, The Providores. The Peasant, another favorite of Clerkenwell residents, is two different eateries under one roof. Downstairs is a boisterous gastropub, with a menu of tapas and platters. Upstairs is a restaurant, with plenty of tables and a quirky collection of circus memorabilia on the walls. The cuisine is a mixture of modern European and Eastern fare. Stay downstairs if you’re looking for brews and pub food, and upstairs If you want a good, decent priced restaurant meal in relaxed and entertaining surroundings. Also, for your shopping pleasures, the Leather Lane Market is a down-to-earth street market housing the likes of everything from fresh fruit and vegetables to cell phones. In addition, everything has a bargain price. This market is a fun spot to take a walk through or shop. Alongside the market are plenty of cafes and stalls catering to the lunchtime crowd if you get hungry on your shopping venture. Clerkenwell is an urban area, although there are a few green spaces, such as the Spa Fields Park. A busy park beside the Three Corners Center youth center and Adventure Playground. The 2.02-acre area includes a children’s playground, tarmac ball court with football goals, tennis nets, and basketball hoops. Also, an annual cornfield meadow takes place during the warmer seasons to encourage wildlife to inhabit this green space. With a blossoming lavender garden, shrub beds, herbaceous borders, trees, this is a perfect spot to relax for a break during a busy day. It is also a great meet up location for a picnic with friends, or to play some sports. Roughly bounded by the tube stations of Farringdon, Barbican, Old Street, Angel, and Kings Cross, Clerkenwell is an incredibly central place to live. You can walk into the City, cycle into Soho or the West End, or St Pancras International is one stop away from Farringdon station.